Having lived in the US for over a decade there are quite a few cost of living differences I notice when I return to visit Canada. One of the more obvious differences between the two counties is the treatment of alcohol. The first and most obvious difference is how one purchases liquor or beer. In many US states liquor is commonly available at any corner store. In Canada, up until relatively recently all liquor had to be purchased through Provincially owned and controlled stores. This history also means that even the privately run liquor stores are typically quite clean, modern, and tidy – one never sees run down malt beverage shops which occasionally dot the landscape of poorer zip codes in the US. The second big difference is in price. The price difference is primarily due to higher “sin” taxes in Canada. However, there is a secondary effect when it comes to imports as higher duty charges also take effect. While visiting this summer I took a look to see what was available in one of the larger stores in Prince George. While domestically produced spirits seemed to be about the same price one would pay for them in the US, some imported liquor appears to be dramatically marked up. 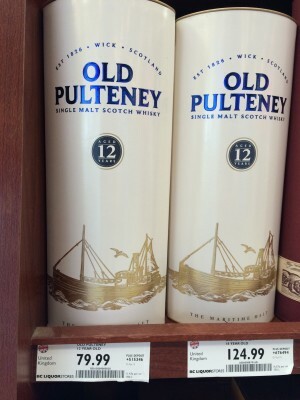 The one which surprised me the most was Old Pulteney Scotch 12 Year – this is a nice Scotch which is typically under $40 in the US ($35.99 as of the time of my writing in San Diego). However, at this LCBBC the price was an eye watering $79.99. I guess I’ll be sticking to Canadian rye when I visit. Anna and I met up with family members to celebrate my Grandmother’s 90th birthday. It was great to see everyone and enjoy the city. We were expecting rain, but instead had some gorgeous clouds and sun. I’ve finally gotten around to posting photos from our trip through Haines, Skagway, and Whitehorse in June/July. It was unseasonably cold, even for the north, but that didn’t detract from the gorgeous scenery. Randi and I both wanted to go diving on Vancouver Island, even though we weren’t going to be there long. We had arranged to go out on a boat dive with one of the local companies, but that fell through during the final week – there simply wasn’t enough customers for any of the dive charters to get out during the week days we were there. It seems like the weakness in the US dollar over the past few years is having an impact on the number of tourists diving. The hesitation from a US point of view is understandable. Though the currency is (or was a few weeks ago) essentially equal, the prices still seem to be left over from a stronger US dollar. Boat dives in Nanaimo seem start at $120 for a double dive. In California most dive boats are in the $70-90 range for double dives. The prices on equipment seemed to be wildly out of sync with the dollar situation as well – prices on dive gear were anywhere from 20-50% more than what one would see in the USA. Rental rates also seemed to be much higher in Canada, I’m expecting that is because of their increased costs for equipment compared to the USA. The boat dives were no longer an option, but we still wanted to dive. We shopped around and chose SOS Scuba because they had by far the best rental prices and were helpful over the phone. The couple runs a nice shop and helped us with directions and information about some shore dive spots. Supplied with directions and gear we headed up the road to Nanoose Bay and into some residential areas until we reached Tyee Beach. The spot is a nice easy slope that breaks off to rock walls on either side. Diving here is pretty dark because of the emerald water, but the visibility was great under 50 feet. There were lots of sunflower stars and lingcod, but we couldn’t find the wolf eels that live in the 80ft range in the walls. We did two dives here and really enjoyed it. The plant life dies off in the winter here, exposing the holes in rocks and clearing the water. I’m definitely interested in trying to make it back up here during the winter months to visit some of the more difficult wall dives with my own equipment. I’m so woefully behind on writing I’ll just post photos for now. For my flight out of Williams Lake there is the same number of airport security people as there are passengers. Bored out of their minds, they took the opportunity to test out all of their new tools – swabbing, testing, and probing my backpack and laptop for explosives and explosives residue. We sit in a little windowed area watching kids running around outside where we would soon be walking to the plane. Good thing security is tight. I’m at this little airport because it was the easiest way to get to my grandmother. My mom and aunts have been there for a while taking care of her – she has had lung cancer for the last few years, and is nearing the end of her fight. Even while she lies in pain she possesses the ability to make a room erupt in laugher. I’ve never met someone so charming, it is little wonder she ran a busy cafe for decades. There are constant callers, in person, and on the phone. She handles them all with ease. I can only hope to have half the grace when it is my time. With a population of about 11,000, the city doesn’t seem to have changed a huge amount. A lot of the town along the highway is the same, but the big box stores seem to have hit downtown hard. I suspect the walmart coming next year will finish it off. The old stampede sign is missing, but the event is still a big deal. The large number of keep your car secure signs suggest WL hasn’t dropped off the top spots for car theft in Canada – I’ve got a story about that I’ll have to type up some time. Economically the city seems to be a mixed bag, but I supposed that’s the way it has always been. Forestry, lumber and pulp, still dominate the town. My family has been working in forestry related industry for at least three generations, probably even more than that when you expand out of the area. The wilderness is viewed in equal parts reverence and business – The forest is beautiful, but I can’t feed my kids with pine needles. Consolidation between multinationals has hurt quite a bit. Worker protections have evaporated, and it is not infrequent to hear of closures wiping out a town. Everyone is worried about the stronger Canadian dollar, or rather, a weaker US dollar. The other concern is mountain pine beetle. You can see vast swaths of brown and red from this bug, turning valleys into tinder boxes. As my uncle says “It used to be that you looked for the red, now you look for the green”. The larvae kill the trees and bring a blue mold that will kill them if the bugs fail to do the job. The winters used to be cold enough to control the bug, but that isn’t happening these days, and probably will never again. Eventually a defense or a predator will emerge, but by that time it could be too late with moving climate zones. Trees here are very tall and slender, each trying to outgrow its neighbor to get the most of the limited sun. With growth taking decades, the idea of large swings is pretty scary – a lot of things won’t be able to keep up. In some ways this place is a paradox to me. Everything seems to mirror my earliest memories, yet fundamental changes are underway. NPR has an interesting story about trying to find the biggest greenhouse gas producer in the US. Canada makes that easy, they have a reporting system. But there is no mandatory reporting system in the US. It seems a bit silly to say the US is serious about greenhouse gas reduction, when EPA doesn’t even know who is producing it. Clearly we need a reporting system. While the story was good, I found the goal a bit flawed. Even if you do find the biggest producers, it doesn’t necessarily mean they are the ones that need the most attention. For example, the top producer in Canada is a coal fired power plant. Probably the same in the US. But that top spot doesn’t take into account how many people are being serviced by that power plant. If the plant is huge, and a lot of people get power from it, it is going to understandably go up on the big list. But it could be that the plant is also a model of efficiency compared to other plants, and the per capita generation is much better than other power generators. While lowering of all emissions is the goal, what we really need is some sort of public and broad measurement of gas output per work unit. The efficient businesses should get credit, and the wasteful ones a healthy heaping of scrutiny or regulation. Anna and I traveled to frosty Canada late Nov and early Dec. Anna managed to survive -45C with a wind chill, and apparently my blood hasn’t quite thinned to SoCal levels. The visit north was really great, and my family has grown – I’ve got a new brother in law. Congratulations to Brooke and Greg! They make a great couple.